I was so excited to learn how to make a bangers and mash recipe when I found what ingredients were in it. This delicious sausage and mash recipe is found throughout the British Isles. The term “bangers” has been traced back to before World War II. During this early time, meat was rationed and sausage was made cheaper by adding a lot of water. 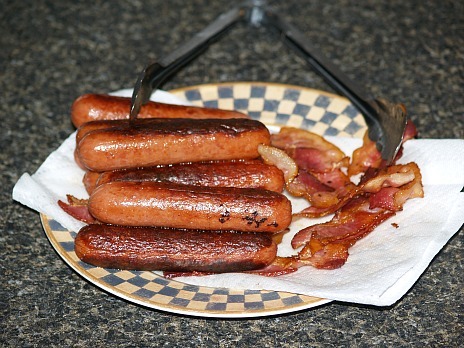 When quickly heating, the sausages would explode and one by one they would make popping noises or “bangs”. When I learned how to make a bangers and mash recipe, I found that the sausages can be made with beef or pork or a combination of the meats. Many seasonings can be added to the sausages like garlic, sage or any of your favorites. It is very easy if you simply purchase your favorite brand of sausages. The “mash” is potatoes. I prefer creamy mashed potatoes but some people like coarsely mashed potatoes. These mashed potatoes might also include some of your favorite spices or even cheese. 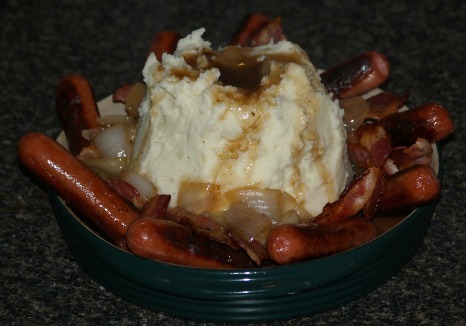 Other ingredients you might include in your bangers and mash might be onions and bacon. Actually, many claim it is a necessity to serve onion gravy with the bangers and mash. The biggest argument about this dish is whether to serve any vegetables. Most British people that I have met are adamant about not needing any added vegetables with this dish; potatoes are the vegetable. It is a very filling meal with just the sausage and potatoes so I see their point. I have heard many say they like theirs with baked beans. Although I love baked beans, I cannot imagine eating something as heavy as beans with this heavy meal. Before I learned how to make a bangers and mash recipe I was introduced to this dish by a little restaurant in Florida. I was driving from Mt. Dora to Tavares and it was about lunch time. I spotted a little English pub and it appeared to be a “true” British establishment. I stopped to have lunch and soon realized I had discovered food tasty enough to be classified as “fine dining”. The menu was filled with all the popular British foods; tea and all. The waitress suggested that I try their famous bangers and mash; it was very filling and deliciously flavored. All bangers and mash recipes which I have tried are hearty and very flavorful. They are cheap to make and a favorite of the British people. This recipe reminds me of my Irish colcannon except I do not put any greens in these mashed potatoes; I prefer to serve a small salad on the side. This recipe will feed at least 8 adults. Peel potatoes and cut into cubs; cover with fresh water in saucepan. Bring potatoes to a boil; cover with lid, reduce heat and cook until potatoes are tender. 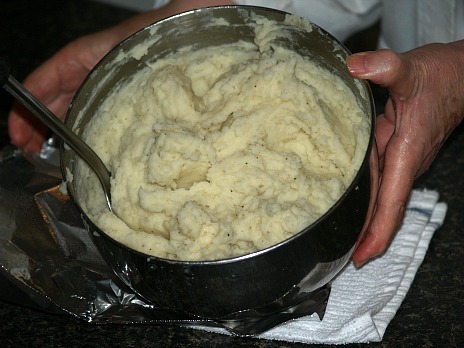 Drain potatoes well and place in mixing bowl; add garlic and mash potatoes. Gradually add milk while beating; beat until cream. 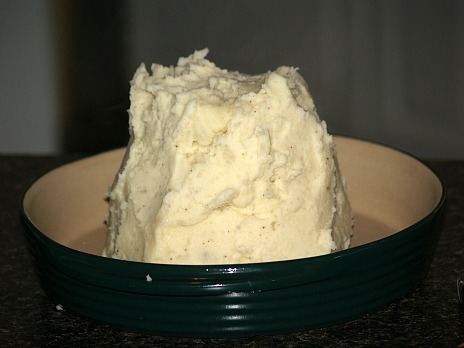 Spoon mashed potatoes into the center of a casserole dish. Shape potatoes like a volcano with a cavity in the middle. Arrange bacon and sausages around volcano. Spoon gravy in cavity dripping a little down the sides. Spoon remaining gravy around the volcano with the meat. While potatoes are cooking, brown bacon halves in a large skillet and remove to platter. Place sausages in skillet with drippings and brown on all sides until thoroughly cooked. Remove sausages to platter; keep warm. 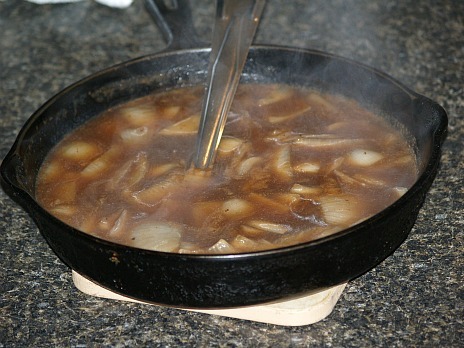 Add onions to skillet and sauté until tender; add water and beef bouillon cubes. Blend cornstarch with enough water to make a smooth sauce. Add cornstarch mixture to broth in skillet; cook and stir until a smooth thickened gravy.